Welcome to another exciting and creative year! We are very excited about our 2014 workshop programme and are looking forward to sharing this with you very soon. We are now in our fourth year, and in 2013 we have been blown away by all the lovely creative people we have met, all the things you have made, our talented tutors, wonderful hosts at the Railway and Gorringe Pubs and Ben’s Canteen and generous funding for special events with Wandsworth Arts, Brick Box and Kingston First. We are having a little holiday, so our 2014 programme will begin after Easter. If you would like to be one of the first to see details of this, please join our mailing list and email Gillian at Crafty Pint. 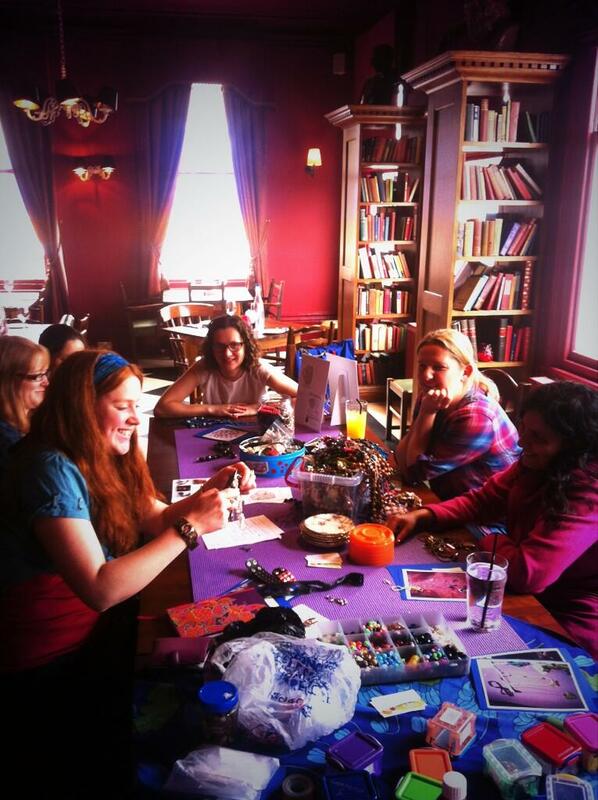 And for younger Crafty Pinters, we now have Moocat Makers Crafty Club for Boys and Girls at the Railway Pub. 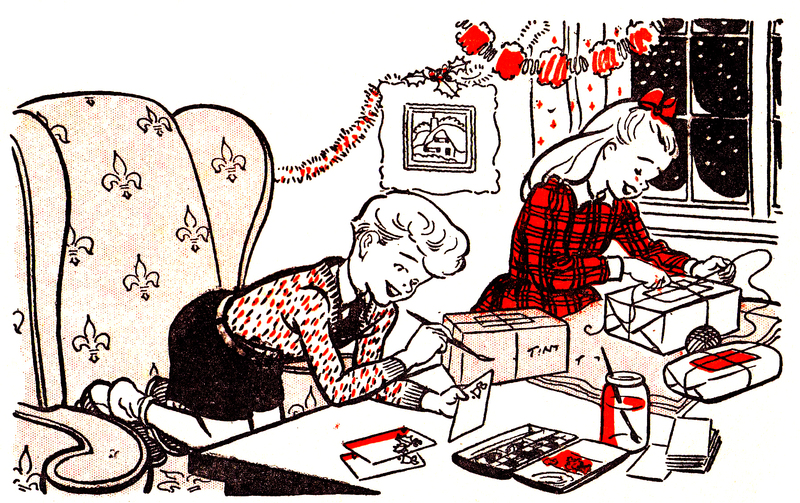 Thanks for all your support and look forward to seeing what you make in 2014! 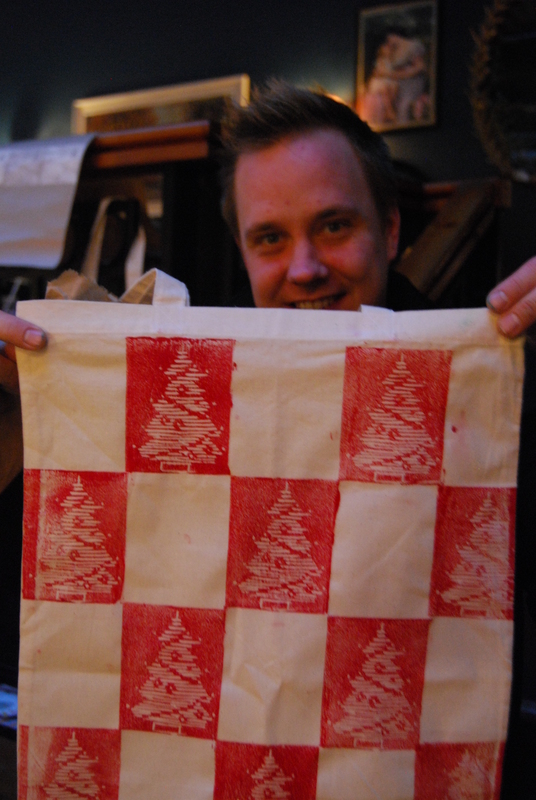 This year’s Xmas Pint will be a cosy evening of crafting a handmade christmas at the Railway Pub in Streatham. Join us for an evening weaving willow stars and wreaths, felting baubles and new for this year, print yourself a set of festive napkins! 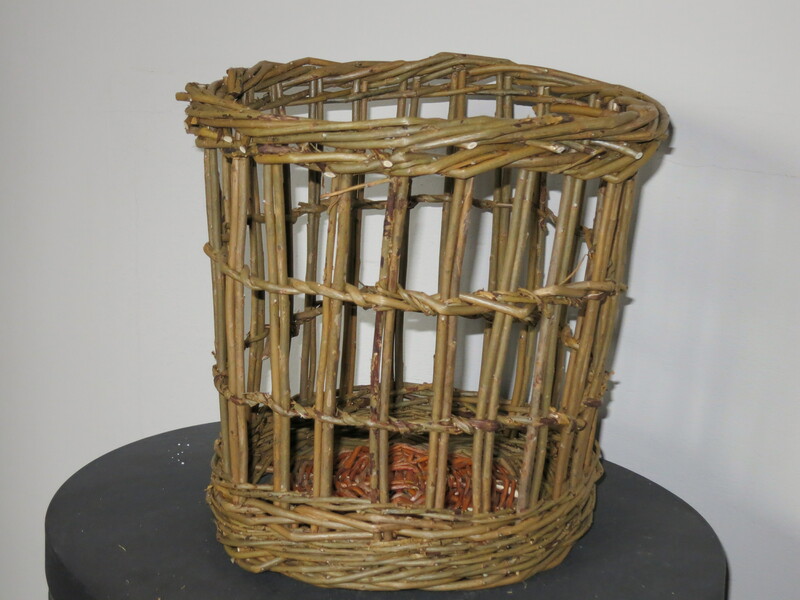 We are very excited to have Geraldine back with her willow workshop, this was very popular last year and lots of fun. 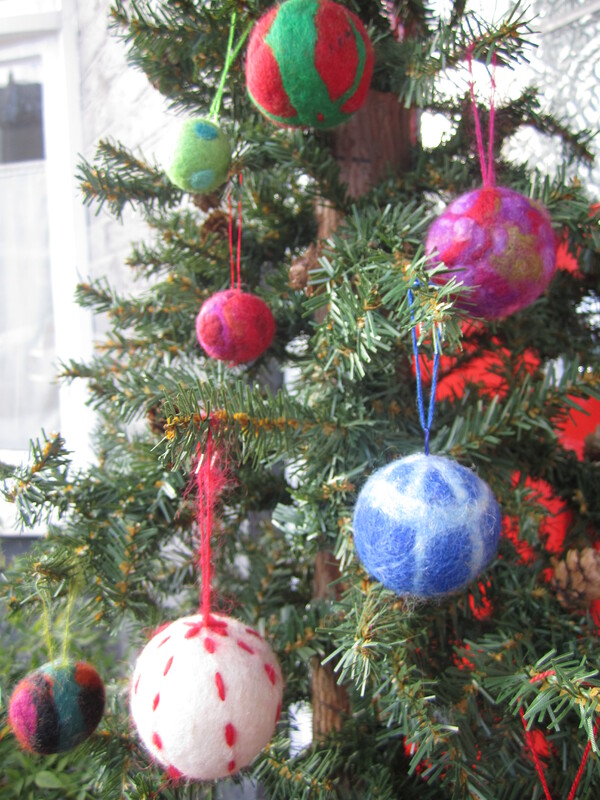 Carol will be joining us with her popular felting workshops and showing you how to turn brightly coloured fleece into festive baubles. 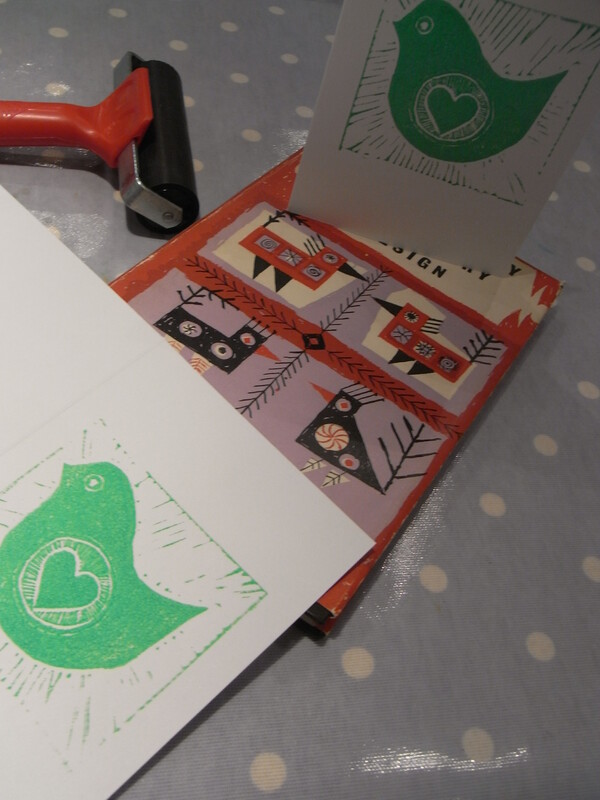 Gillian will be sharing her passion for lino printing and helping you to print a set of festive napkins, perfect for a handmade present! 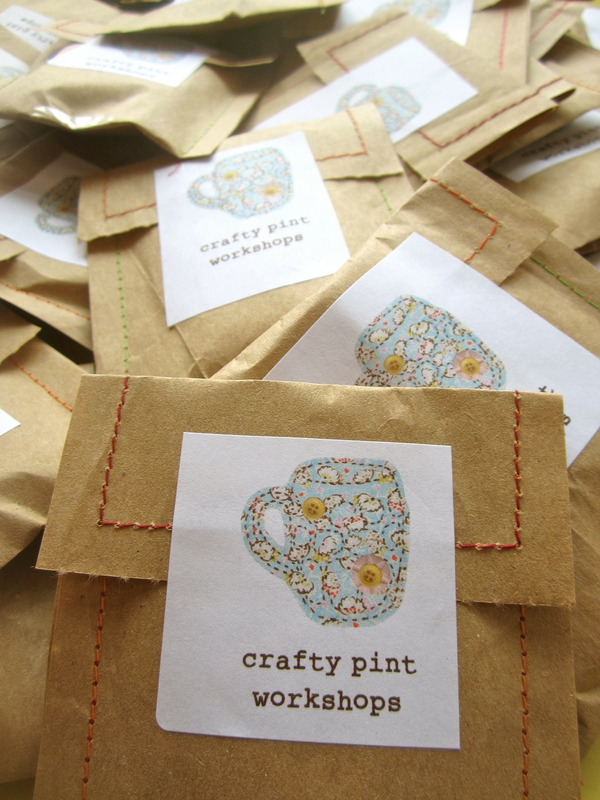 At our mini Xmas Pint you can pick and mix your workshops and pay as you go for whatever you make. 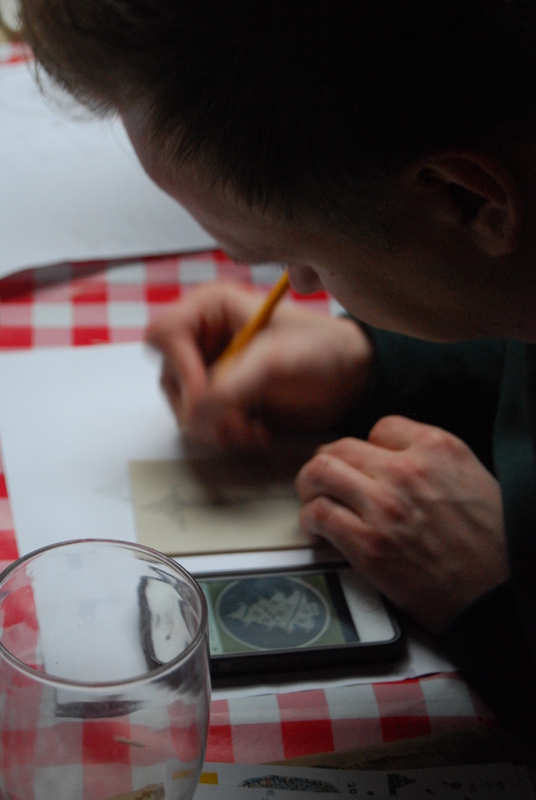 Crafty Pint workshops are friendly and informal. We will provide tons of materials to choose from as well as lots of examples, one-to-one help and demonstrations. Suitable for beginners, no experience needed. Please email Gillian at Crafty Pint to reserve a place. The workshop fees are payable cash on the day. 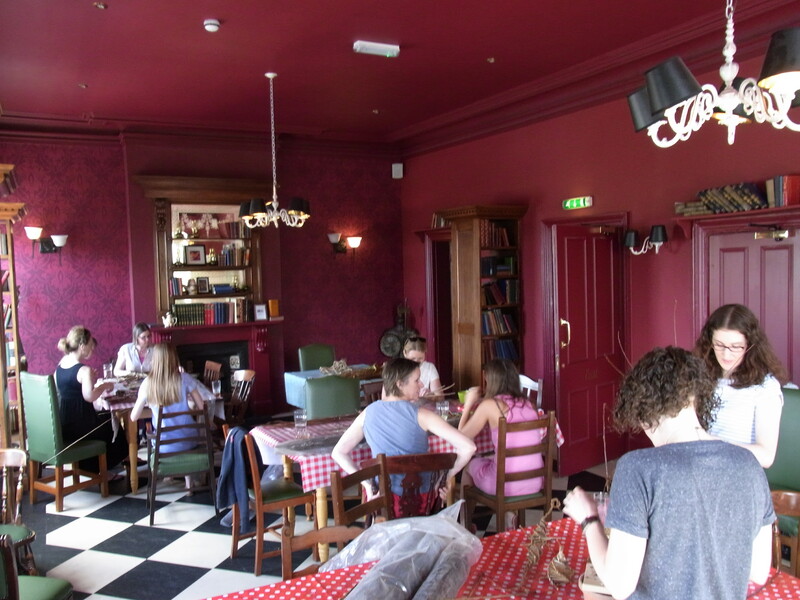 Workshops take place in the Railway Pub’s new tea rooms where you can also sample delights from local bakers The Wren Sisters as well as The Railway’s menu of independent ales and wines and yummy pub meals. The Railway, 2 Greyhound Lane SW16 5SD, opposite Streatham Common Station. The Railway pub is just across the road from Streatham Common station, served by Clapham Junction, East Croydon, Balham and Victoria and is accessible from Tooting, Streatham and surrounding areas. 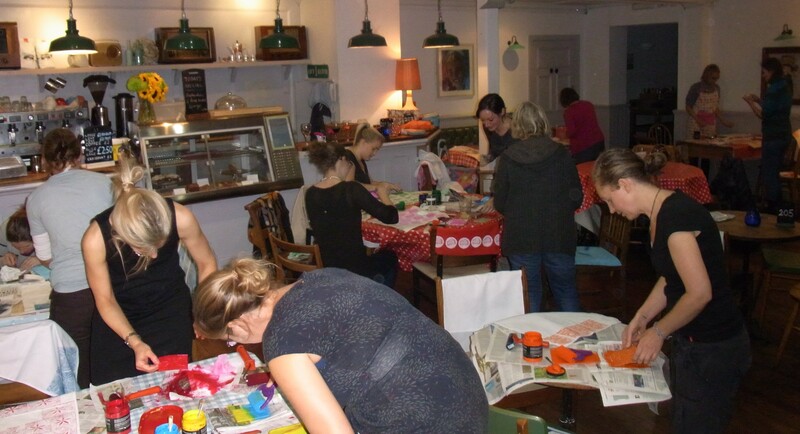 Our next workshops at The Railway pub will be christmas themed evenings making gifts, decorations and cards. 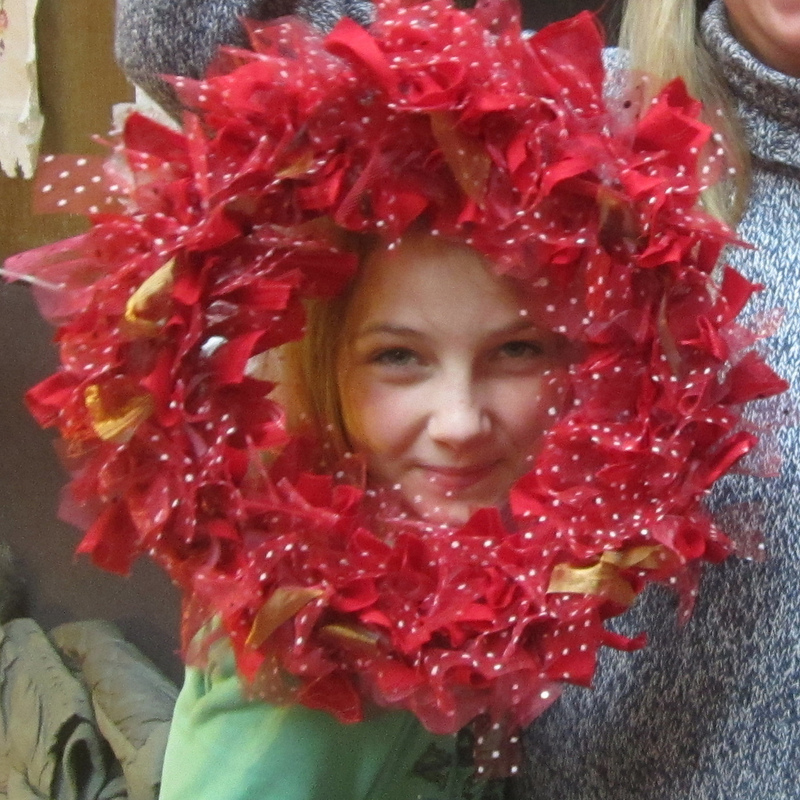 Flaming Nora will join us for an evening making fabric wreaths and festive dangles! 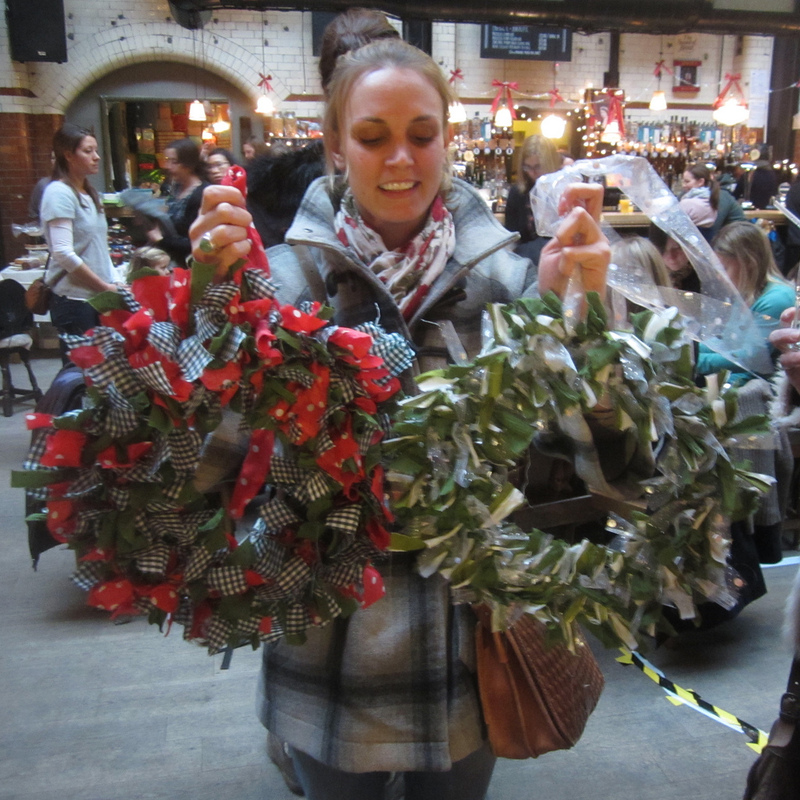 Jane from Flaming Nora is a talented seamstress and her wreath making workshops were very popular at last year’s Xmas Pint. 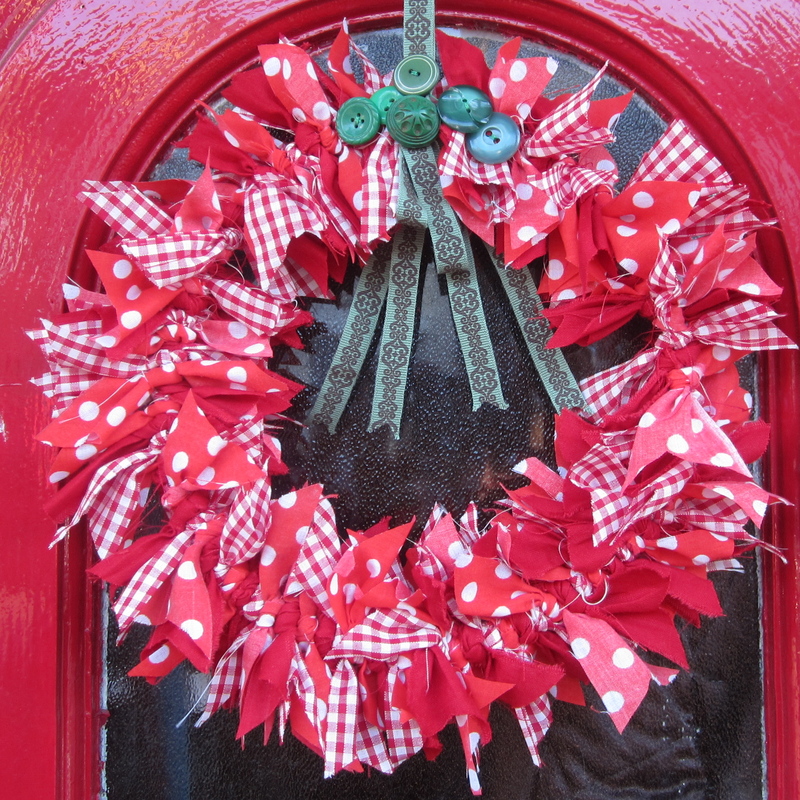 Jane will demonstrate fabric wreath making using scrap fabrics and ribbons and will show you how to transform cotton reels into pretty festive decorations. We will be holding a mini Xmas Pint in December. Join us for an evening weaving willow stars and wreaths, felt baubles and new for this year, print yourself a set of festive napkins! 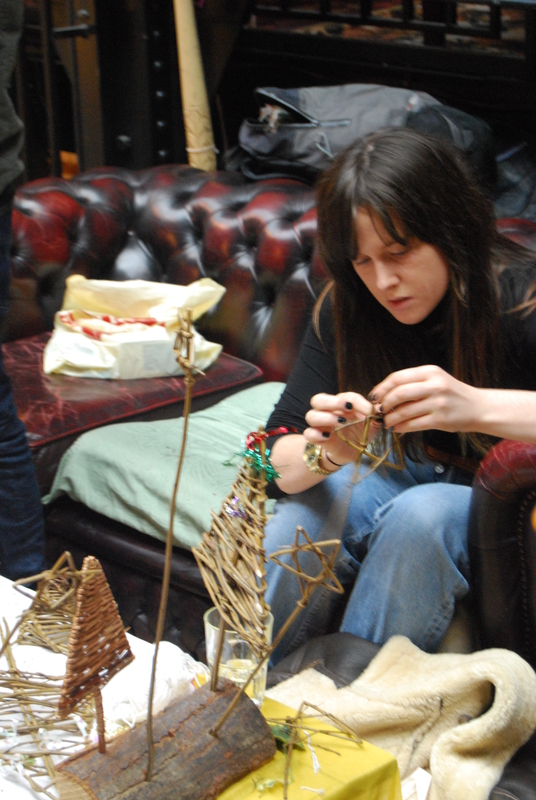 Our thee-hour workshops cost £20 and all materials and tutors are included. At our mini Xmas Pint you can pick and mix your workshops and pay as you go for whatever you make. 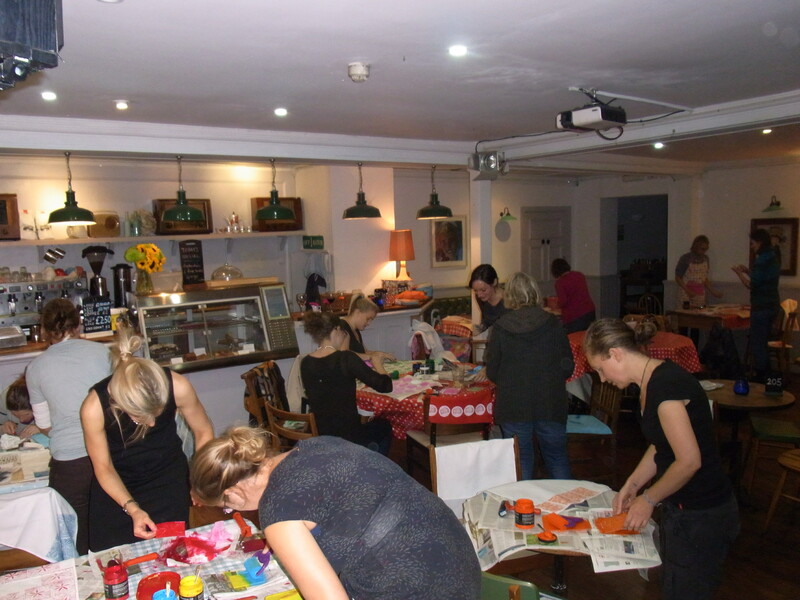 Crafty Pint workshops are friendly and informal. We will provide tons of materials to choose from as well as lots of examples, one-to-one help and demonstrations. We make sure you go home with something you have finished! Suitable for beginners, no experience needed. Please email Gillian at Crafty Pint to reserve a place. The workshop fees payable cash on the day. 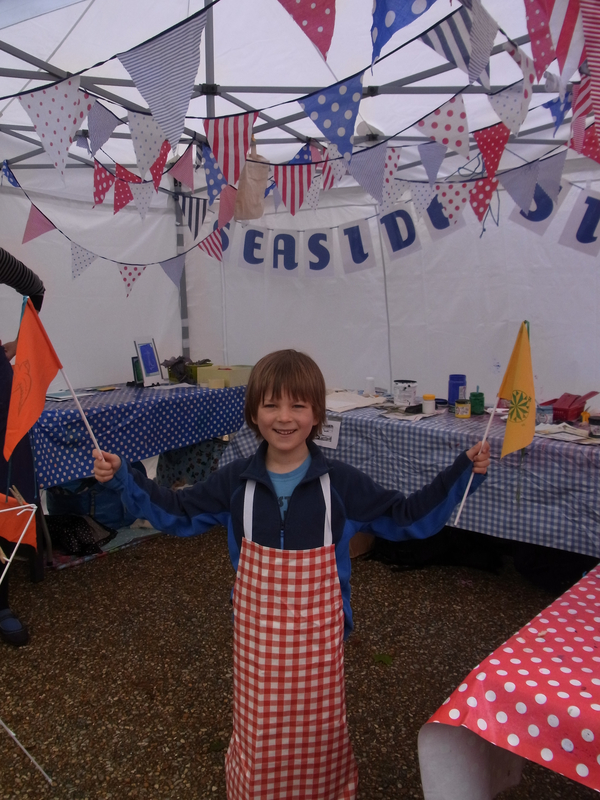 We will be popping up at Wandsworth Open Studios with a tea towel printing workshop and pottery painting during the first two weekends of October (5th and 6th October) and (12th and 13th October). Drop in and have a go! Email gillian@craftypint.co.uk for more details. 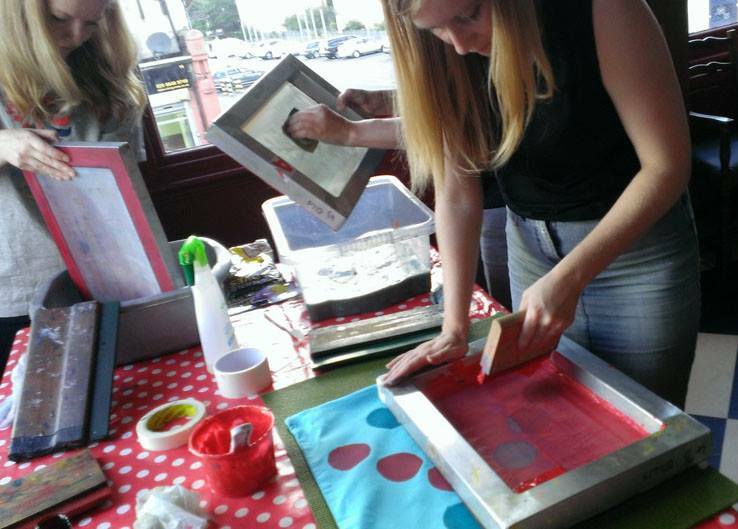 We will be experimenting with lino prints and printing cushions and tea towels at The Railway this Wednesday 9th October from 7.30pm. 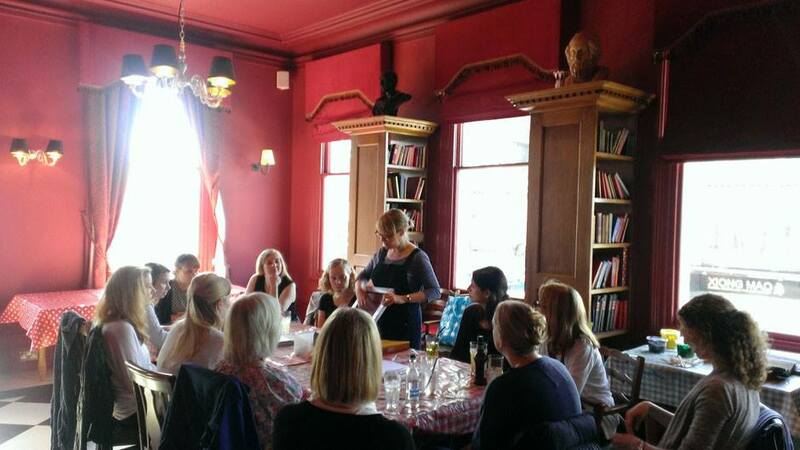 Email gillian@craftypint.co.uk to find out more and book a place (£20pp). Here are some pics from our last workshops for inspiration. 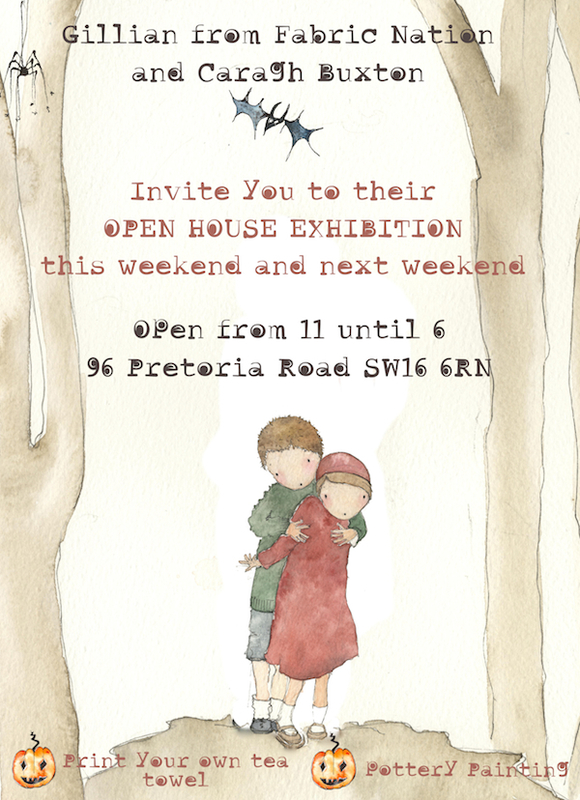 We are taking a short break from our Tooting workshops while we go on some adventures of our own with our new family. The Gorringe Park Pub have been brilliant and we are looking forward to returning in 2014! In the meantime, we will be running ad hoc events and will keep you posted. Coming up next in Tooting will be willow weaving with Geraldine and screen printing cushion covers with Justine Ellis, and after a summer break, Alex will start our autumn workshops in Streatham with a knit a phone (or camera) cover class. 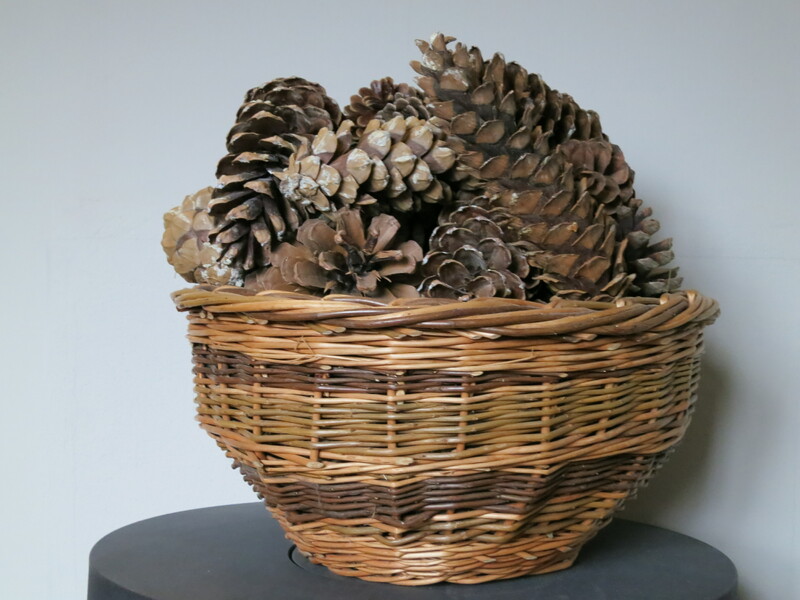 Geraldine’s workshops were so popular at our Xmas Pint, that we have invited her back for an afternoon of making baskets and sculptures. At our Xmas Pint, Geraldine showed people how to make stars and wreaths, at this three h0ur workshop, she will show you how to make a choice of tray or a small basket as well as plenty of samples and doodles to help you learn different weaving techniques for your own projects. 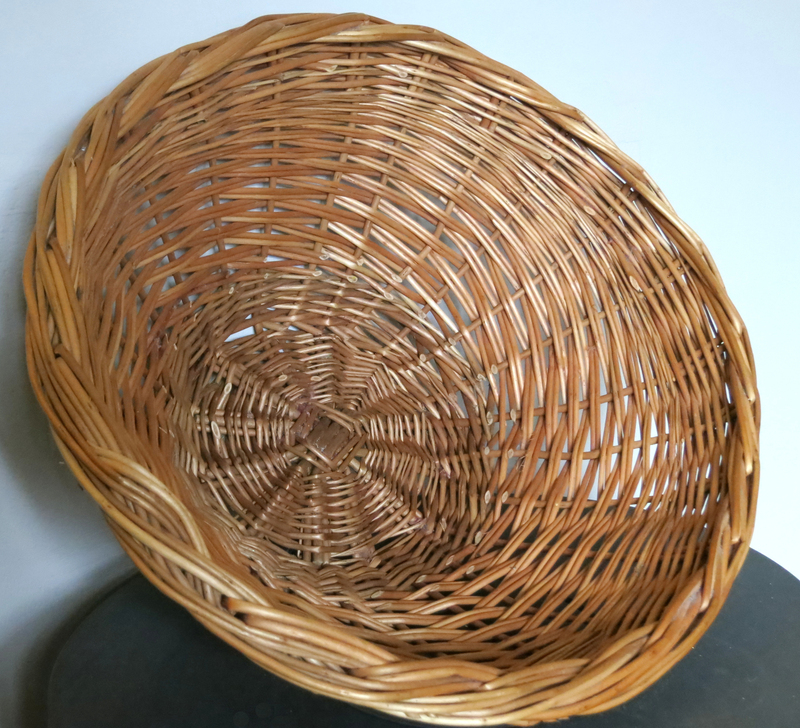 We will work with prepared willow (soaked and mellowed); newspaper, and whatever plant leaves are available on the day and learn different techniques such as cordage, coiling, looping and basic basket-making. At the end of the workshop you will come home with a choice of woven tray, willow ‘sunflower’ or fish, your own hand made string, plus whatever you turn it into. Dirty hands and worn fingers an added extra! 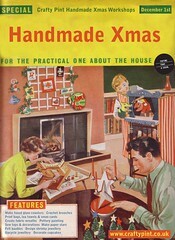 Geraldine grew up with textile handy-work in a ‘make-do-and-mend’ sort of way. She turned to making baskets, plus weaving, spinning and dyeing, in a moment of disillusion at the allotment – ‘How is it that weeds manage to grow so quickly and so well in next to no space?’ She organized a series of alternative workshops hoping to find some use for those dreadful weeds. The outcome has been a fascination with world-wide and age-old techniques of basket-weaving. Geraldine uses whatever natural material comes to hand – plus newspaper which comes in conveniently large quantities, very cheaply. 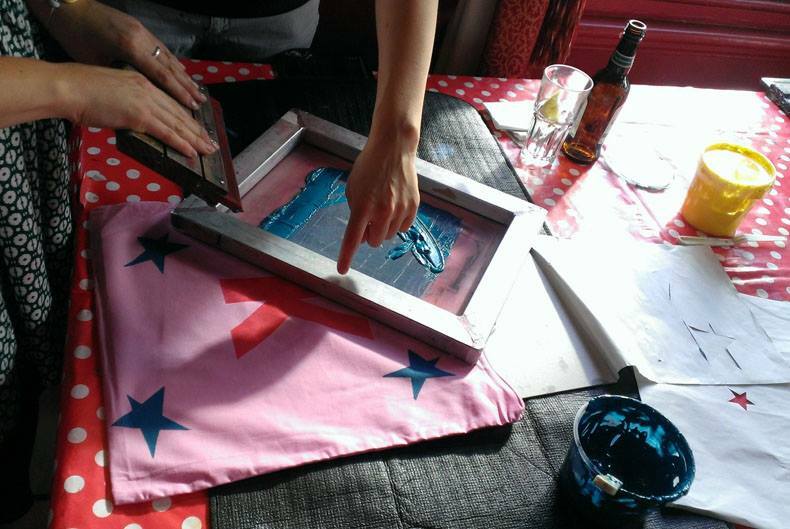 Join talented screen printer Justine Ellis for an afternoon learning how to create your own designs, make up screens and print up your own cushion to take home. Justine Ellis is a London based printmaker and designer who specialises in original, hand screen printed, art and homewares. Her designs have a bold, textural quality reminiscent of mid century textiles and ceramics. She will share her approach to printing, where each print begins life as a drawing or paper cut collage before being transfered into a silk screen print. Justine is also an experienced tutor having taught teenagers with special educational needs before finding her home within the inky world of screen printing and now she can be found teaching adults to screen print and designing and facilitating arts workshops for young people. 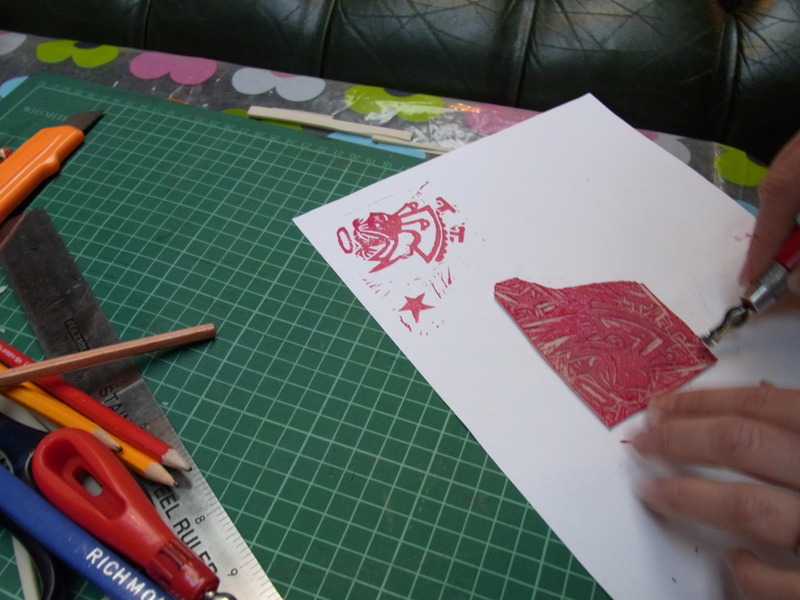 The thee-hour workshops cost £20 and all materials and tutors are included. We will provide tons of materials to choose from as well as lots of examples, one-to-one help and demonstrations. Suitable for beginners, no experience needed! Please email Gillian at Crafty Pint to reserve a place. Next to Tooting rail station or 44, 77, 264, 270, 280, 355 buses from Tooting Broadway. Join talented south London artist Alex who will share her love of knitting with you. Alex has devised some simple yet effective knitting patterns so you can knit a cute cover for your phone. Learn to knit and protect your phone from bumps and knocks with a super cool, but snug knitted cover. This workshop is suitable for all abilities. Alex will show you the basics of knitting and provide one-to-one trouble shooting. 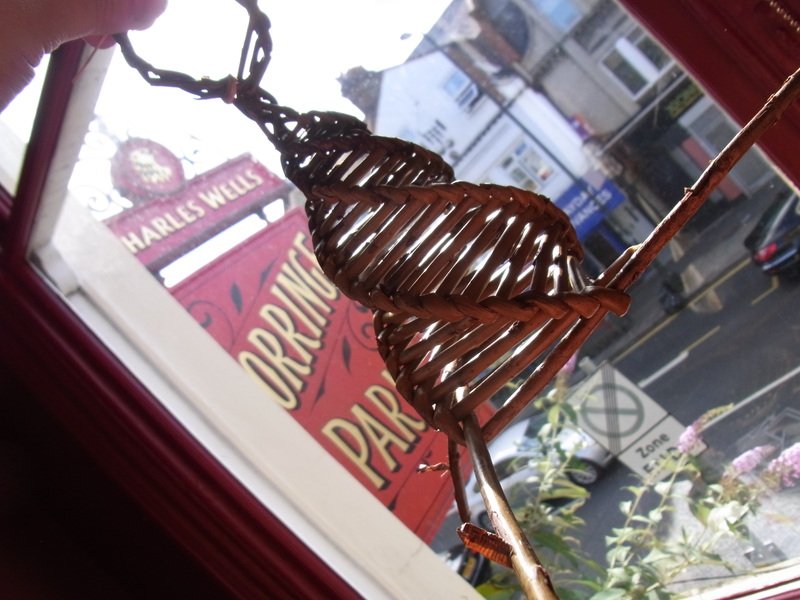 Vegetable sculptures – create animals and mystical creatures from fruit & veg kindly donated by Sheringhams. Roll a button – a game of skill and buttons! And did we mention prizes! 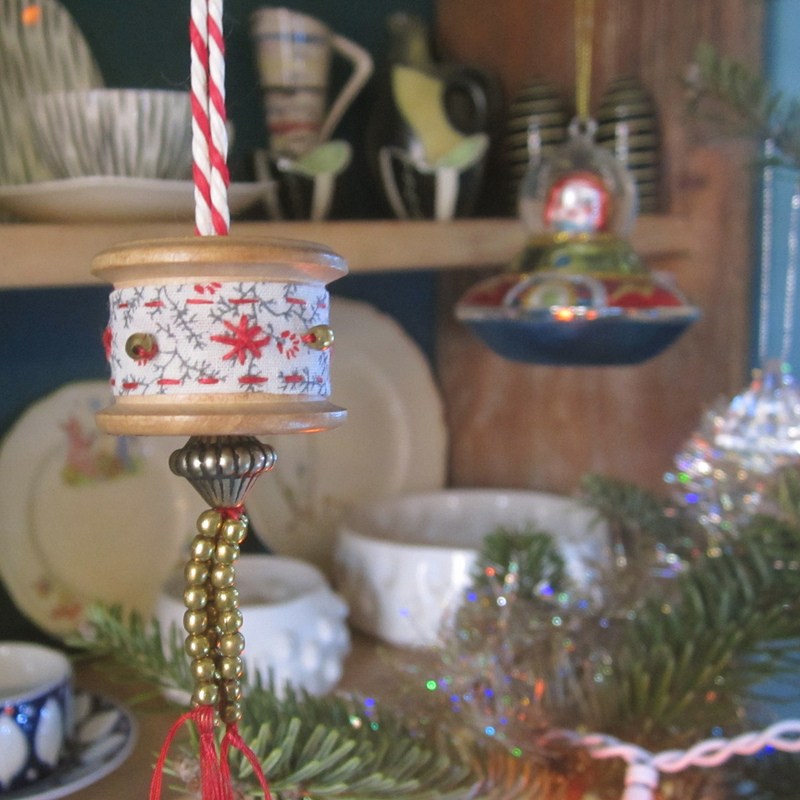 We have been scouring the streets for the best vintage haberdashery treasures and crafting handmade gifts for you to win! 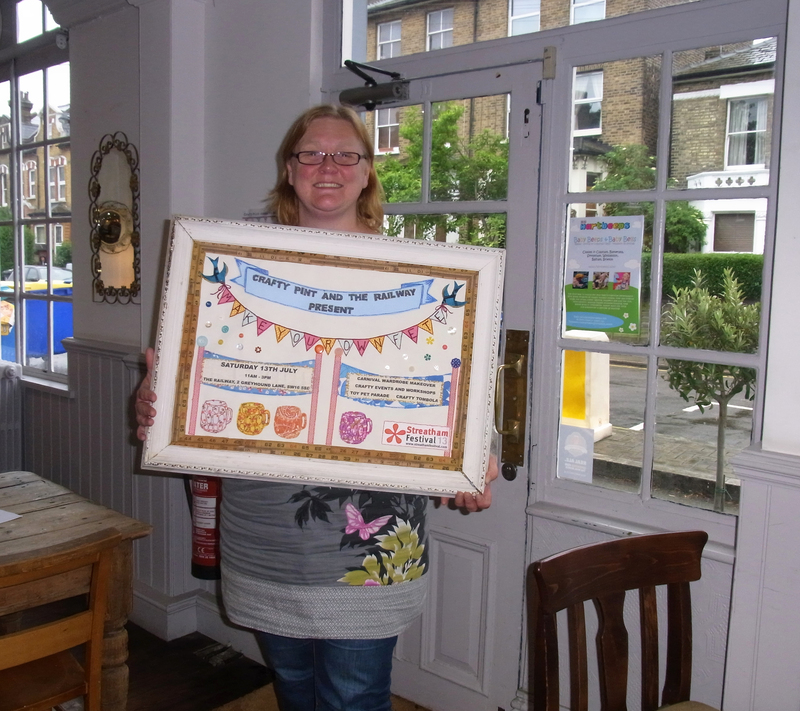 And here is Jane with her beautiful banner, currently on display in The Railway. This event is part of the Streatham Festival and co-incides with the Lane & Vale Carnival and The Railway pub farmers market. The carnival parade will feature the famous Giant Mechanical Elephant, The Binbots, Bollywood Brass Band, Vintage Cars, and much more! A lively high energy carnival parade will depart Streatham Common at 10:30am with a second parade departing Streatham Vale at 12 noon. 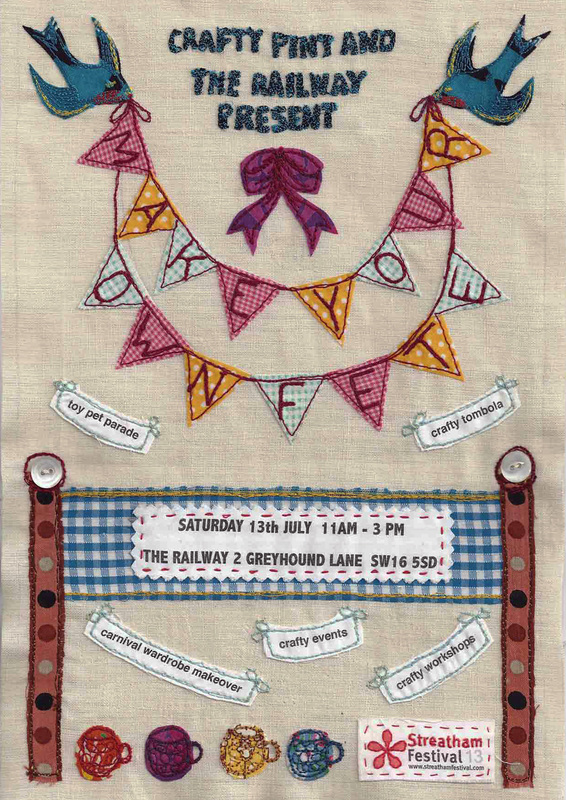 After the carnival and fete, take a stroll up Greyhound Lane to join the Streatham Festival on Streatham Common for a glamorous afternoon of dancing, tea and fun. 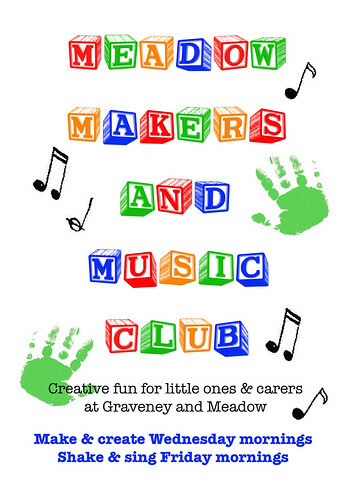 Join us on Saturday 13th July for an afternoon of crafty fun. 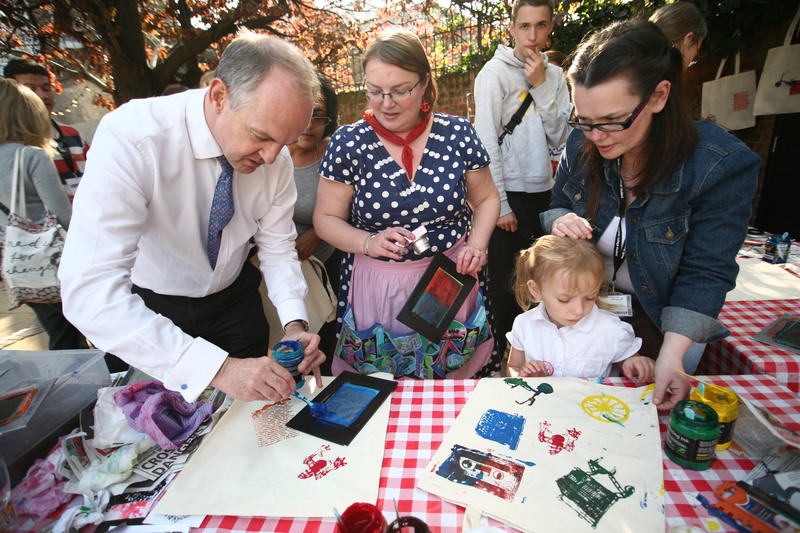 There is no need to book, there will be lots of activities to choose from and workshops are suitable for all ages. Please do email Gillian at Crafty Pint If you would like more information. 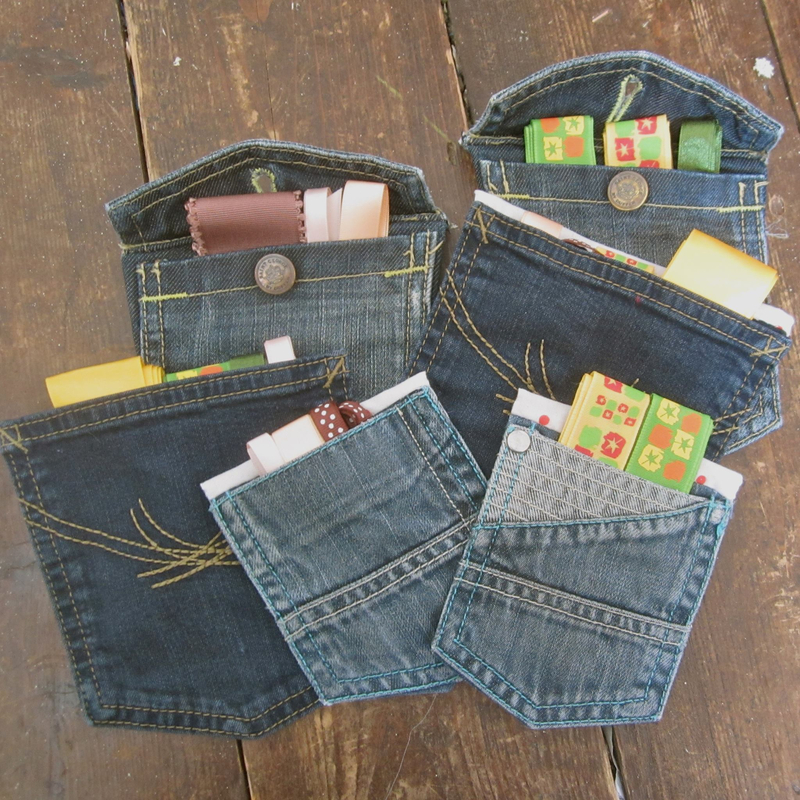 Saturday 6th July – Saucy Postcard Textile Workshop! 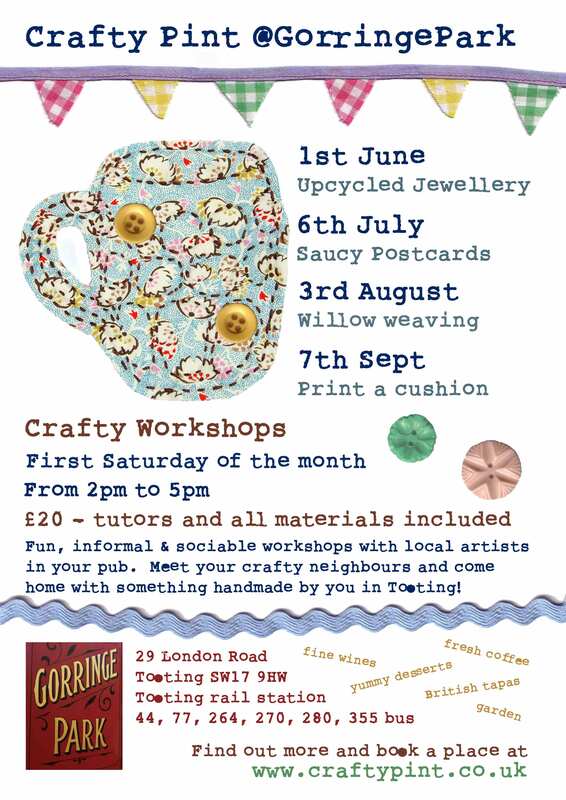 Join Flaming Nora for an afternoon of saucy stitchery at our regular Tooting workshops! 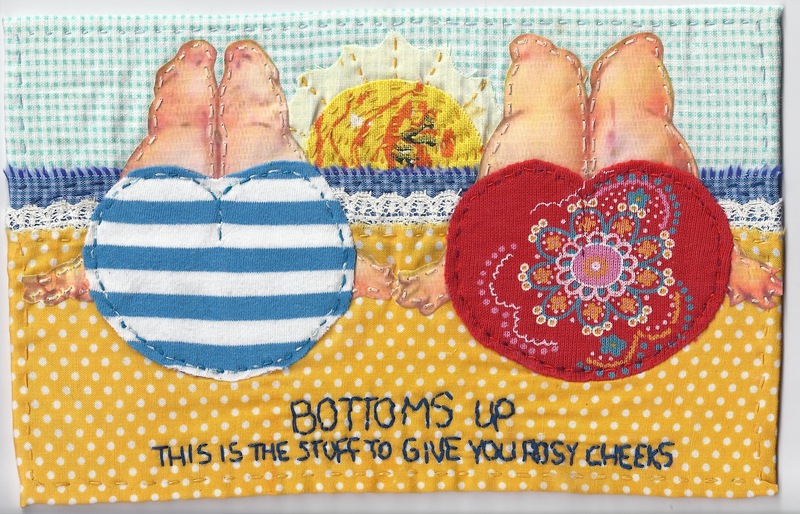 We all know them, we titter at them, we all love them, now’s your chance to make your own Saucy Seaside postcards. 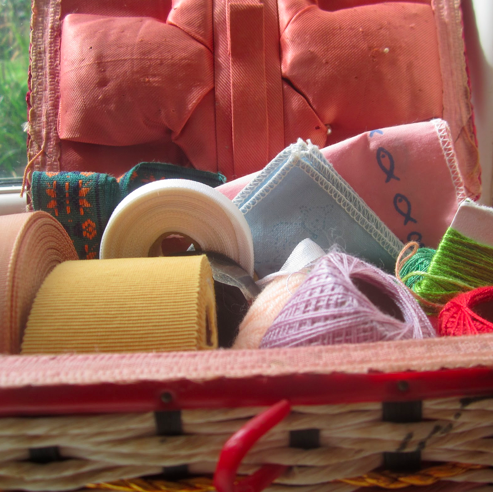 Spend the afternoon mixing up collages of fabrics, trims and papers to make some old fashioned summery postcards. 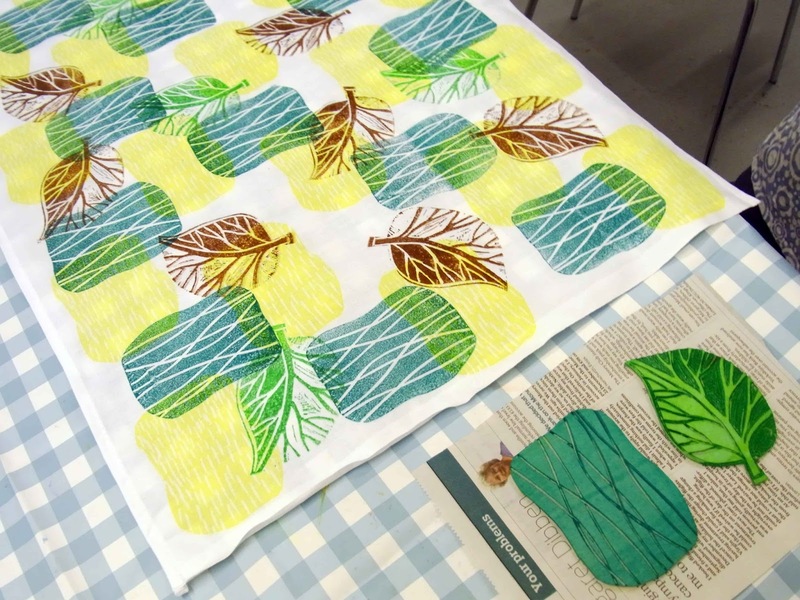 Learn how to applique and collage with textiles. They are fun to make and will have you sniggering all day long! We will bring our collection of spots, stripes and vintage fabrics and trims as well as a selection of seaside images for you to choose from. Make one or a set! Send them to your friends or frame a cheeky pair for your wall. Jane is an amazingly talented seam mistress, she makes costumes for west end theatre productions as well as her own fabulous creations. She will have lots of nifty techniques and skills to share at this perfect summer workshop. The Gorringe Park is a beautiful, welcoming pub next to Tooting rail station and just a short walk or quick bus ride from Tooting Broadway. They serve a fab menu ranging from British tapas to yummy desserts and have lots of light, space and even a garden and a cinema. Ed and Josh have been very welcoming and are very keen to make the Gorringe Park community pub with lots of events for Tooting people to enjoy. This three hour workshop costs £20 and includes all your materials and tutors. We will provide tons of contemporary and vintage fabrics and trims for you to choose from and our tutors will be on hand to give you demonstrations and one-to-one advice. Please email Gillian at Crafty Pint to book a place.